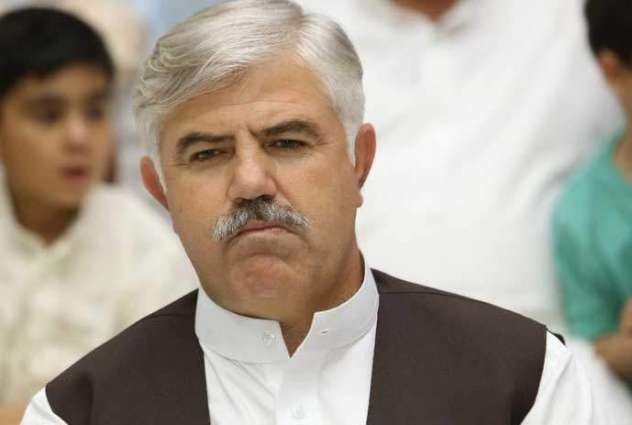 Peshawar: Chief Minister Khyber Pakhtunkhwa Mr Mahmood Khan inaugurated 220 kV Grid Station Chakdara, constructed by National Transmission and Despatch Company Ltd (NTDC) here at Chakdara, Swat district of KPK. Chairman Senate Committee on Power Senator Fida Muhammad, Provincial Minister for Revenue Mr Shakeel Ahmad, MNA Mr. Junaid Akbar and Managing Director NTDC Mr Zafar Abbas was also present during the ceremony. Chief Minister KPK Mr Mahmood Khan addressed the ceremony and congratulated NTDC management and said that construction of 220 kV grid station Chakdara was direly needed in the area and it is a gift for the people of Swat and other areas. Now power supply will be stable with improved voltage profile and consumer will not face forced load shedding. He said the federal government’s interest and keenness towards ending power crisis is remarkable. He assured NTDC management to extend his all-out support to resolve the issues of land acquisition for NTDC projects of grid stations and transmission lies especially in Hattar and Rashaakay. Managing Director NTDC Mr Zafar Abbas also addressed the inauguration ceremony and said that 220 kV grid station has been constructed with the cost of Rs 3230 Million funded by ADB within shortest time span. Now 220 kV grid station Chakdara is a second source for power supply to Chakdara, Thana, Timmer Gara, Malakand, Saidu Sharif, Swat, Madyan, Khawaza Khela, Shangla, Dargai and other areas. He also appreciated and thanked the local people of Thana for their contribution extended for completion of this project. He said that 220 kV Chakdara, D.I Khan, 220 kV grid station Mansehra has already been energized whereas 220 kV Noshehara will be completed soon. He said that NTDC, in line with the efforts of present Govt for ending load shedding, working ambitiously to complete its ongoing project within stipulated time. Dy Managing Directors NTDC, General Managers, Chief Engineers, officers, staff and large number of local party workers were also present during the ceremony.